This may just be the greatest band I’ve discovered this year. 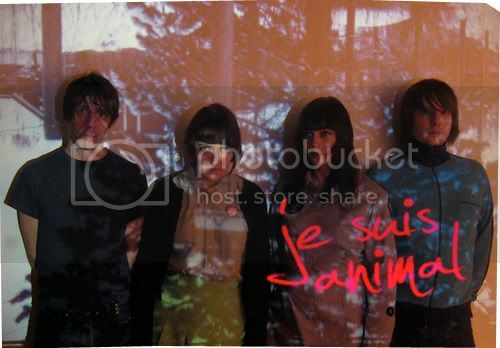 Je Suis Animal is a Norwegian pop group whose band members are partly British and Norwegian, for having conceived in a British art school before eventually settling in Oslo. Their music is an impressive blend of jangly pop, droning guitars, and pretty girl-group part harmonies. I know it’s nothing to be impressed by because you’ve heard me describe music this way numerous times. But this is way too brilliant to be ignored, simply way too brilliant. 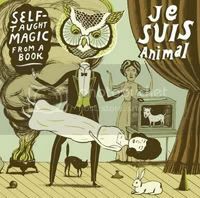 Their 2008 album, Self-Taught Magic from a Book (love the title! ), drips with jangly pop perfection piled atop sweet, enticing melodies that’ll get you swooning during days on end. The band’s MySpace page cites influences such as Velvet Underground, Stereolab, and My Bloody Valentine, and nary has a list of influences been more accurate. Take a listen to the intro of ‘Rousseau World’, and notice the similarities, which as it so happens could also be linked to Strokes’ ‘Is This It’ or that Pixies song. A strong feel of pop psychadelia circa C86 heavily permeates the record throughout, though the record itself isn’t a consistent display of sweet pop tunes; post-punk guitar explosives may slip in once or twice and pretty harmonies may turn into haunting whispers. Nevertheless, this album is undoubtedly in strong contention as my album of the year, so be sure to look out for it. Just one song... that’s not right is it? Here are 3 more.